Vietnam is a country in Southeast Asia, located along the South China Sea, Gulf of Tonkin and Gulf of Thailand, and bordered by Cambodia, Laos and China. Vietnam is an extremely biologically diverse country; according to the American Museum of Natural History, “the country is only slightly smaller than California … which is the most biologically diverse state in the continental United States. Yet Vietnam is home to 50 percent more plant species and over 80 percent more land-dwelling vertebrate species.” There are many and diverse species of reptiles throughout the country of Vietnam. There are two species of crocodile that can be found throughout Vietnam: the Siamese crocodile and the saltwater crocodile. However, due to overhunting and habitat destruction, both species are rarely found in the wild in Vietnam. Saltwater crocs are the largest crocodile species in the world, reaching lengths of up to 20 feet, with the largest specimens weighing in at over a ton. 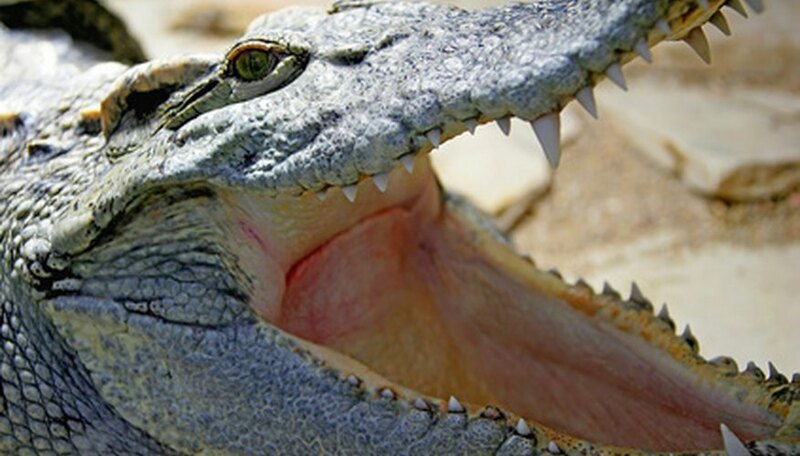 As the name suggests, these crocodiles inhabit salty, primarily brackish, waters. The Siamese crocodile is a much smaller species of freshwater crocodile that reaches a maximum length of about 13 feet. Large populations of Siamese crocs are domestically bred and raised throughout parts of Vietnam as a source of food, clothing and other crocodile products. Many species of lizard make their homes in Vietnam. In fact, some species, like the green pricklenape lizard--a foot-long arboreal lizard with spikes down its head and back--live exclusively in Vietnam and the surrounding area. Some other species of lizard endemic to Vietnam include the Asian glass lizard--a legless lizard that looks like a snake, the Vietnamese leopard gecko, the Chinese water dragon and various species of monitor lizards. A large variety of both venomous and nonvenomous snakes can be found throughout parts of Vietnam. One of the more interesting and rare species is the rhinoceros snake (not to be confused with the highly venomous rhinoceros viper). Also called the rhino rat snake and green unicorn, this horn-nosed species of snake is found almost exclusively in the highlands of Vietnam. Another species of snake endemic to the area is the venomous Oriental pit viper, a mountain-dweller, found throughout the Himalayas and the Hoang Lien Mountains of Vietnam. Other snakes that can be found throughout Vietnam include various species of pythons, cobras and kraits. Several species of turtles and tortoises can be found in Vietnam. However, like the crocodiles, many of these chelonians are facing endangerment and extinction, due to both habitat destruction and overhunting. The Indochinese box turtle (or Vietnamese box turtle), which comes in a variety of colors and subspecies, can be found in parts of Vietnam’s Truong Son Mountains; According to the American Museum of Natural History, “this box turtle is the most popular turtle in the Vietnamese wildlife trade.” Other species of chelonians found throughout Vietnam include the impressed tortoise and green sea turtle. In addition, small populations of the extremely rare Hoan Kiem turtle and Swinhoe's soft-shell turtle--both thought at one time to have been extinct--have recently been discovered in Vietnam. Miller, Carl. "The Types of Reptiles in Vietnam." Sciencing, https://sciencing.com/types-reptiles-vietnam-6599208.html. 25 April 2017.